Who remembers the days of break dancing and ghetto blaster? Well, for those of us who still enjoy sharing music with friends, SkullyBoom is doing their part to help cut down on the earbuds we see everyday. These portable speakers are customizable and available in several different colors. What really drew me to them was their familiar look. Fortunately, SkullyBoom is also a vinyl canvas. They are available in black, white, and glow-in-the-dark and are perfect for anyone who enjoys customizing. Here's my attempt at creating my favorite dead guy out of a SkullyBoom. SkullyBoom will be sponsoring a contest here in the coming months! 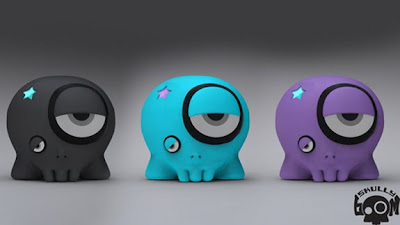 We have three SkullyBooms to give away with some cool artwork by Squidnik. This contest will launch soon and run slightly longer than previous ones. One thing is certain, additional entries for this contest can be earned by customizing your very own SkullyBoom! These will be available in the Zombie Toy Store shortly but I am gauging interest now. If you plan on picking up a SkullyBoom, drop me an email at zombiesandtoys@gmail.com. They will be priced at $9.99. SkullyBoom is what happens when art and technology get intoxicated and hook up. haha, Oh that is brilliant, I love your logo attempt! What paints do you use them with? I kinda really want one now!